#InTheStudioThisWeek: We’ve been sprucing up our portfolio. This involved sorting through all the printed deliverables we have created for our clients over the last 17 years (nearly 18!). Very Exciting! 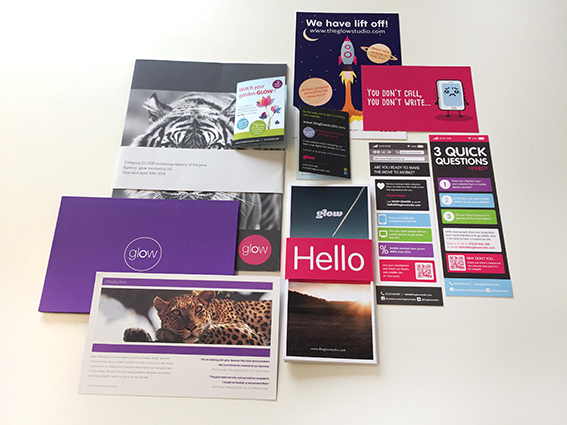 We love being organised at Glow, and it was also a great opportunity to look back through previous work, as well as some real treasures – Glow’s old branded marketing materials. It’s really interesting to see how the Glow brand has developed and changed over the years. As well as seeing the changing styles and trends in logos, colour schemes, typography, content and general design aesthetic. 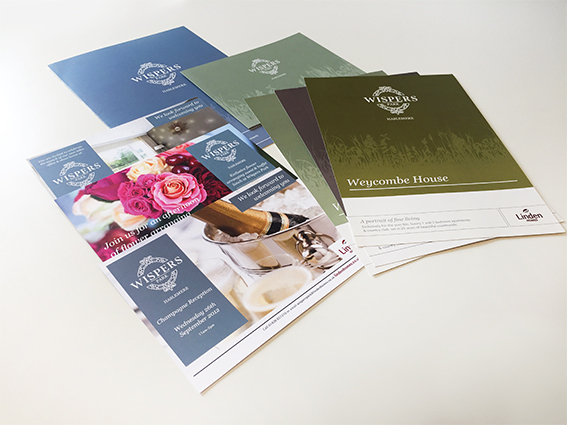 We’ve organised all work alphabetically, by client, to ensure our portfolio pieces are accessible and easy to locate when we want to show off the wide range of work we produce, and the different print finishes we can offer to new and old clients alike. We’re very versatile, that’s for sure. Our long-standing clients have been dedicated their very own folders. This has ensured we have enough space to accommodate the copious amounts of print deliverables we have produced for them over the years – this doesn’t even cover digital examples too! 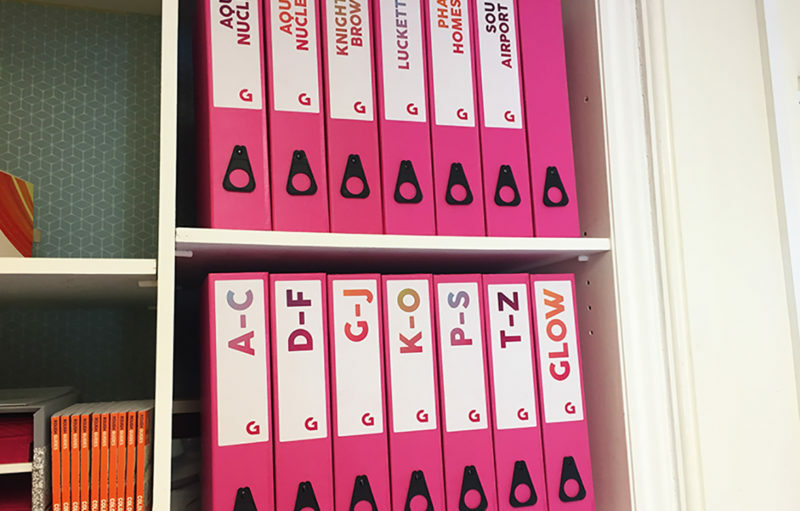 We have kept one folder spare to store all of the wonderful print examples we have come across or been given since the dawn of Glow, showcasing different finishes, paper stocks and effects. It’s a great source of inspiration! We wanted to share with you some of our favourite designs from our portfolio. Some you may recognise from our website and previous blogs, but others will not have been unveiled before. The first is the Annual Reports that we have produced over the years, for long standing client, PHA Homes (formerly Petersfield Housing Association). 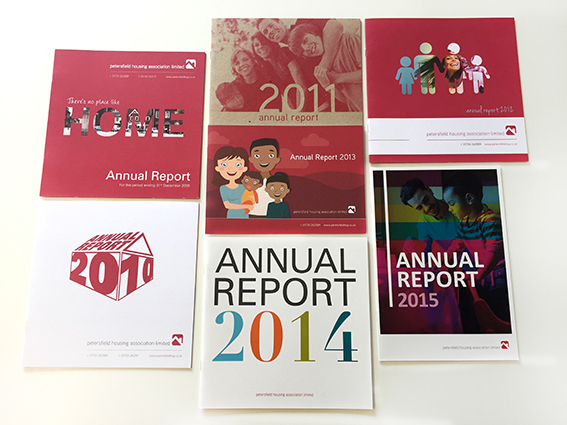 As you can see, each year, the report has taken a unique styling, but always maintains the company branding. PHA Homes underwent a rebrand in 2016. We are yet to have copies of both the 2016 and 2017 reports – but we’ll be sure to update you when we do. The second is the creative campaign we developed for Linden Homes, to promote the retirement village, ‘Wispers Park’. This extensive campaign ranged from producing a hand-illustrated logo, branding, e-alerts, national press advertising, brochures, bags, signage and mailers. 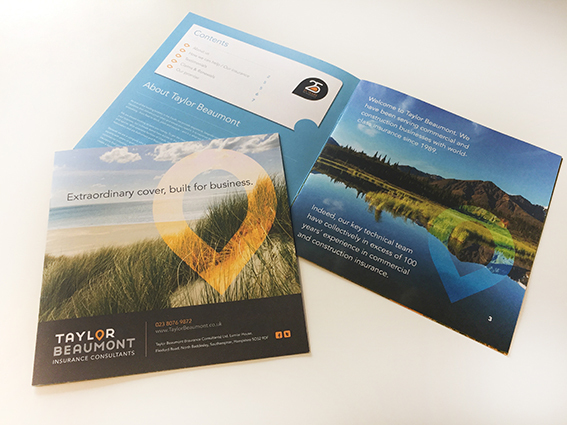 The next highlighted portfolio piece is the Taylor Beaumont Brochures created back in 2014. We love the combination of the aspirational scenic imagery and pull quotes and bright colours to compliment. 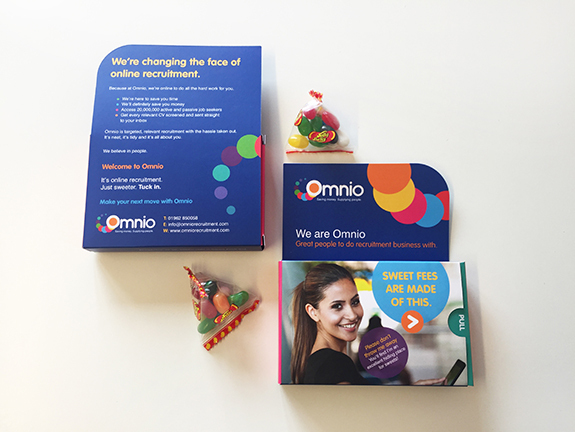 The fourth is the promotional deliverables – designed, printed and posted for Omnio Recruitment. We think this was such a great way to engage with the target audience. Who doesn’t love vibrant promotional materials, which are filled with sweet treats and feature great puns? And finally, just a small range from the collection of old Glow marketing materials. This showcases Glow’s previous two brands, before the big event of our rebrand last year! We love getting really creative with our promotional pieces as you can see. After a lovely trip down memory lane, we’re ready to start creating new designs so we can keep on adding to our portfolio!